Twenty-five years ago the Kingdom of Valdonia was under siege by an army of darkness. The magical forces of good only had one hope - a chosen one destined to lead them to victory. Douglas Peterson was that hero. Only he wasn't. He was an 8-year-old boy from Earth scared out of hi... read full description below. Twenty-five years ago the Kingdom of Valdonia was under siege by an army of darkness. The magical forces of good only had one hope - a chosen one destined to lead them to victory. Douglas Peterson was that hero. Only he wasn't. He was an 8-year-old boy from Earth scared out of his mind! The frightened boy turned tail and skedaddled, hoping to never see his childhood wonderland again. 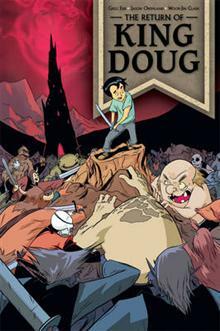 Now as an adult, Doug is about to learn that his adventure in Valdonia was only beginning and that there are some things you can never run away from.